Multi-Cel Setup of Archie and Reggie Presented on a Watercolor Production Background. THE ARCHIE SHOW 1970’s Multi-Cel Setup of Archie and Reggie. Presented on a Watercolor Production Background. THE ARCHIE’S 1970 Two Production Cels of Archie & Reggie Presented on a Production Background from the Film. THE ARCHIE SHOW 1970’s Multi-Cel Setup of Archie at HIs Desk in Riverdale High. Presented on a Watercolor Production Background. THE ARCHIE SHOW 1970’s Multi-Cel Setup of Betty and Veronica Presented on a Watercolor Production Background. THE ARCHIE SHOW 1970’s Multi-Cel Setup of Moose, Reggie & Archie Presented on a Watercolor Production Background. 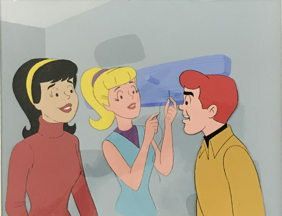 THE ARCHIE SHOW 1970’s Production Cel of Archie Presented on a Watercolor Production Background. THE ARCHIES 1970 Multi-Cel Setup of Moose, Betty & Veronica Presented on a Watercolor Production Background. THE ARCHIE SHOW 1980’S Production Background of a Room with a Lamp and a Chair in Front of a Window with Drapes. Overall Size 10 x 13 1/2 Inches.